Gutting It Out: Tales Of Sports Heroics In The Face Of Injury, Illness : The Two-Way Arguably the dominating narrative of the U.S. Open was 27-year-old golfer Jason Day's ongoing struggle with benign positional vertigo. Jason Day of Australia is tended to by medical staff Friday after finishing the ninth hole during the second round of the 115th U.S. Open Championship at Chambers Bay in University Place, Wash.
Jordan Spieth won the 2015 U.S. Open on Sunday, but the tournament's most compelling story wasn't necessarily that of the 21-year-old American, who is now halfway to golf's elusive grand slam. It wasn't even the much-maligned state of the greens on the Chambers Bay course, which Sweden's Henrik Stenson said was like "putting on broccoli." No, what was arguably the dominating narrative of the four-day tournament was 27-year-old Jason Day's ongoing struggle with benign positional vertigo. 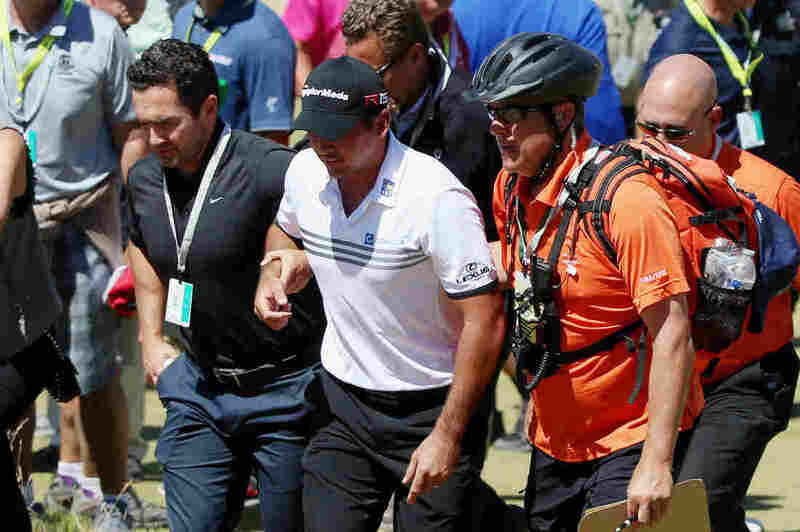 The balance-ruining affliction was so severe that the Australian golfer collapsed on the course on Friday. Despite it all, Day was a contender until the final round. He entered Sunday with a share of the lead, but shot a disappointing 74 in the last round and finished in ninth place at an even par. Day's efforts in this year's U.S. Open were undoubtedly remarkable — and appreciated. Sports fans cherish tales of athletes playing through pain and physical discomfort perhaps because they represent the best values of sports like grit, perseverance and selflessness. Shaking, feverish and weak from flu-like symptoms, Jordan still racked up 38 points in the Chicago Bulls' Game 5 victory in the 1997 finals to take a 3-2 lead over the Utah Jazz. The Bulls went on to win the NBA championship in six games. With two stress fractures in his left leg fractured, Woods somehow managed to limp his way to his third U.S. Open title, beating Rocco Mediate in a sudden-death playoff. With a ruptured tendon, the Red Sox's Curt Schilling pitched seven innings in Game 6 of the 2004 American League Championship Series against the Yankees. The stitches from the surgery on his ankle caused him to bleed through his sock, which was later sold at auction for more than $90,000. Favre played the 2000 NFL season with tendonitis — in his throwing arm. The Green Bay Packers QB started in a record 297 consecutive, regular season games. During the 2010 playoffs, Chicago Blackhawks defenseman Duncan Keith took a puck to the face that knocked out seven of his teeth. But after a swift — and surely gruesome — locker room visit, he returned to the ice to help the 'Hawks clinch the series over the San Jose Sharks and advance to the Stanley Cup final.